This one Hour New Orleans Segway Experience Tour is perfect for those who want more ride and less talk. 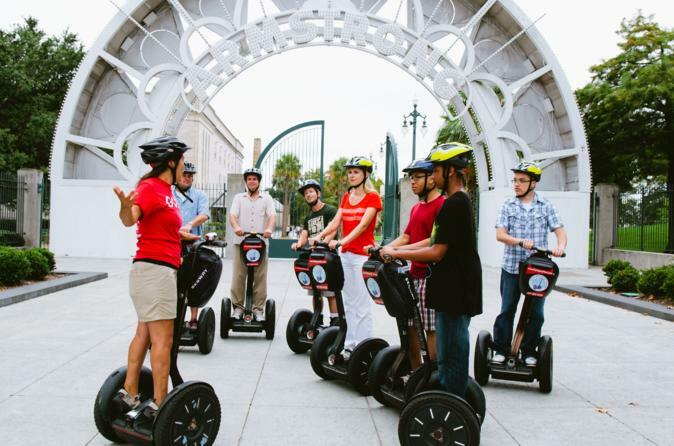 Your tour will begin with an orientation on the operation of the Segway along with some practice time. Once you’re comfortable, you and your guide will cruise around the French Quarter, covering a surprising amount of ground in a short amount of time. Kicking up a breeze on Segway is the best way to experience New Orleans! Your tour begins on Decatur Street in the French Quarter with a 30‐minute training in the basics of Segway use. Once you’ve got your bearings on the electric two‐wheeler, you’ll take off on a whirlwind adventure with your expert guide. The French Quarter - Whether you call it the French Quarter, the Vieux Carre' or just "the Quarter", this is the heart of the city for New Orleans Natives and tourists. Mississippi River Front - Stand on the banks of the mighty Mississippi River and learn about why the French chose to colonize New Orleans. Enjoy sweeping views of the West Bank and catch a glimpse of a steamship paddling by. The Treme Neighborhood - Made popular by the post-Katrina HBO series, Treme has always been a cultural incubator for the City of New Orleans and the United States at large. Louis Armstrong Park - It's only fitting that the birthplace of Jazz be found inside what is now known as Louis Armstrong Park, named after one of the city's favorite sons. Jackson Square - When the French first settled in New Orleans this was the center of the city. Surrounding the Square are some the oldest buildings in the city and in the US. Among them are the St. Louis Cathedral. The Old U.S. Mint - Once a working US Mint (the only Mint in the US to have coined both US and Confederate coins) this historic landmark now houses part of the Louisiana State Museum. Frenchman Street - If you're looking for where the locals go to enjoy music you'll find it just outside the Quarter on Frenchman Street. Your guide will tell you where the best show will be that night as you glide past the wildly painted music halls, cafes, and restaurants.